The SNB’s latest 13-F form filings (yes, the Swiss central bank lists its US equity holdings like the hedge fund that it is) to the SEC were released this week. And, like every other quarter, we take a closer look to see what stocks the world's only hedge fund central bank that prints money out of thin air bought, and on rare occasions, sold. This was one of those rare quarters. After some modest fluctuations earlier this year, the SNB's reported equity allocation was unchanged in 3Q at 21% (and includes no bank stocks to avoid conflicts of interest, yet somehow owning a chunk of equity of virtually every other US public company is not a conflict of interest?). This is notable because as JPMorgan writes, the SNB’s behaviour in 3Q18 appears contrarian. 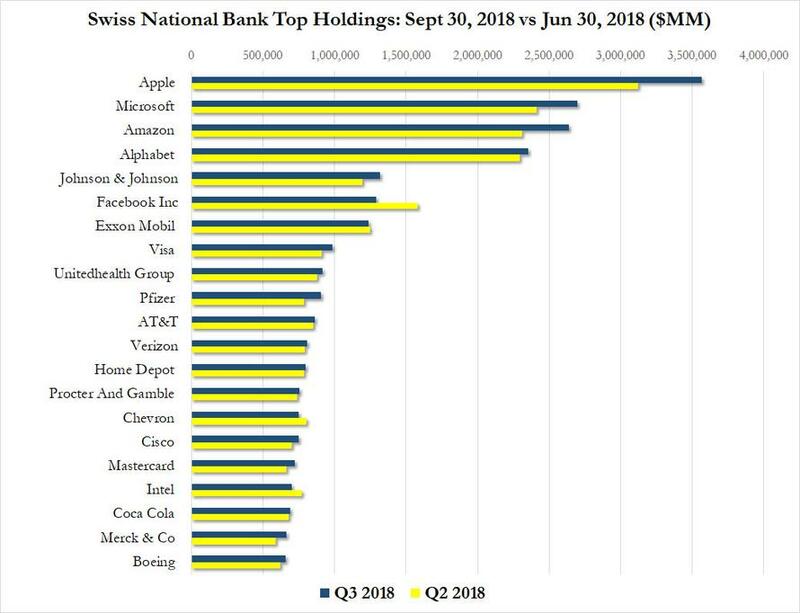 While the chart below shows that the overall value of the SNB's US listed long holdings rose by over $2 billion to $90 billion, most of this was due to the price appreciation and according to JPM calculations, the central bank sold around $7bn of equities in Q3 based on the returns on non-financial sector equities. This compares to purchases during 1H18 of around $6bn. The central bank also reportedly bought around $3bn of bonds in 3Q, following largely flat bond purchases in 1H18. In addition to taking some profits just as the market peaked this year and ahead of the nasty October rout, here are some other notable observations: in the third quarter, after the SNB printed money out of thing air, it then sold 1.1 million shares of Apple, 893K shares of MSFT, 44K shares of Amazon, 83K shares of Alphabet, 296K shares of FB, and 526K shares of XOM. 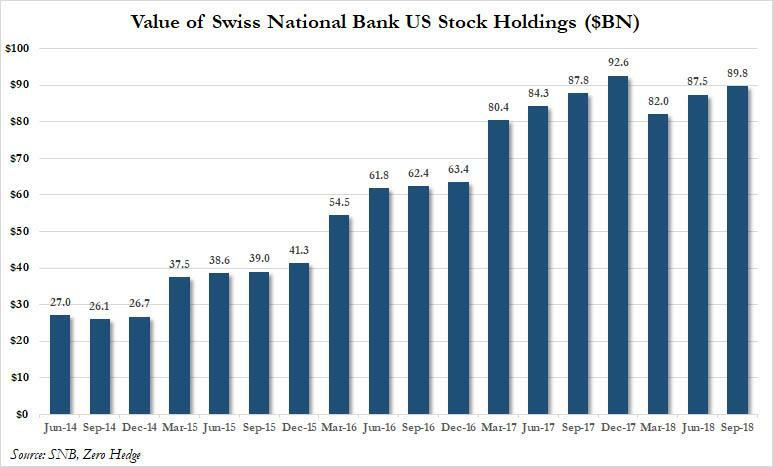 Also according to some calculations, the SNB's portfolio now generates over $1 billion worth of dividends, or as @SheepleAnalytics notes, "they print money and we ship them our profits." While we are far beyond the point of debating central bank intervention in equity markets (we do want to remind readers that until several years ago, it was considered "fake news" to even mention it, and those who accused central bankers of manipulating stock markets were said to be paranoid tinfoil basement dwellers), we want to point out that unlike the BOJ, which at least keeps its capital markets distortion local, the SNB, which likewise creates money out of thin air (then sells it for dollars in an attempt to keep the Swiss franc depressed) is actively causing substantial price distortions in the US while collecting billions in annual dividends from US corporations which are then remitted to various Swiss cantons and regional governments to fund local growth. While we doubt this will be investigated with stocks at all time highs, we look forward to the Congressional hearings after the crash when the scapegoating and fingerpointing begins as it always does, and everyone is "stunned" to learn that central banks were responsible for blowing the biggest asset bubble the world has ever seen by directly buying stocks. First, its top 20 holdings are as shown in the following chart. While the market value of its investments was generally flat or slightly higher, the actual number of shares of all top 20 holdings declined as the market hit its all time hihg. And more notably, unlike most other hegde funds, the SNB was actually selling at the top. Whether it will resume purchases now that the US market has correct remains to be seen, although the mere rumor or leak that the Swiss National Bank was now selling its tech names may have been among the unspoken catalysts that precipitated the violent selling in October. 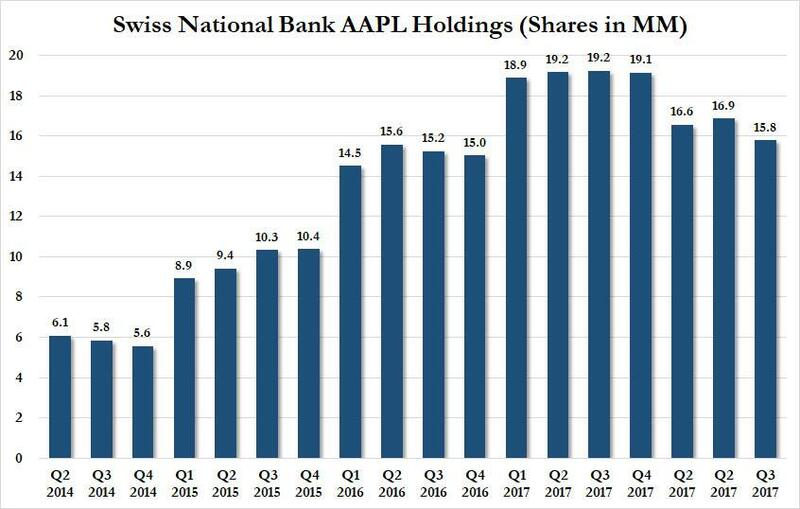 And while we have yet to learn if Warren Buffett was actively frontrunning the SNB once again during the quarter, this time by selling AAPL shares, a look at the SNB's holdings of AAPL stock shows that after some modest selling in the first quarter, in Q3 the central bank's AAPL holdings again shrank modestly from 16.874 million shares to just 15.8 million, and while the SNB is still a larger holder of Apple than say Deutsche Bank, Franklin Resources, Prudential, Allianz or the State of New York (with 15.7, 15.0, 13.2, 12.9 and 12.6 million shares respectively), and just behind Dimensional and Wellington, one has to wonder if the SNB's sale of AAPL - now that it is public - will lead to even more weakness for the company which recently top-ticked its own growth, announcing it would no longer disclosed iPhone unit sales. Still, we wouldn't be too worried: after all, when a central bank can and does create money out of thin air, any buying pause is only temporary, especially if its portfolio drops to a level when the local politicians may start asking questions.